Cast-iron skillets have long been treasured kitchen staples for stovetop frying and oven baking, and this skillet from Le Creuset delivers that same level of reliable performance time and time again. Comfort foods like cornbread are often prepared in a cast-iron skillet lined with bacon drippings or vegetable oil—and chefs everywhere attest to the cast-iron skillet’s unique ability to produce the desired balance of a crispy golden crust and a soft, fluffy interior. This round skillet features sloped sides for dripless pouring of fats and oils. Matte-enamel interior requires no seasoning and is ideal for sautéing and searing meat. Durable enamel construction protects skillet—inside and out—from chipping, cracking and excessive wear. Goes effortlessly from oven to table for beautiful presentation. Each skillet is painstakingly polished and finished by hand, then sprayed with two coats of enamel and fired twice. This durable enamel construction protects skillet—inside and out—from chipping, cracking and excessive wear. Le Creuset’s unique skillet construction delivers excellent heat distribution and retention. Goes effortlessly from stovetop or oven to table for beautiful presentation. The 10" cooking surface accommodates multiple servings. Great for everything from sautéing and searing meat to baking cornbread. My first cast iron skillet after 48 years of cooking! I decided I would get the absolute best cast iron skillet even though I won't have many more years to use it and I'm so glad I did! I have used a Le Creuset grill pan for the past 20 years and love it, so knew the kind of quality I would get. I haven't used it a lot so far, but it is exactly what I wanted. The skillet is great out of the box. It just needs to be treated per the instructions for any good iron skillet. The only thing that could make it better would be an oven safe wrap for the handle. I purchased one of these based on the reviews of no sticking. I don’t know how they can make those claims when everything I cook in it sticks! I have to soak the pan to get off the stuck on egg or whatever else I have cooked in it and I used olive oil or ghee to lubricate the pan before adding ingredients. Not sure what others are doing differently to get a more positive experience. $200 buyers remorse! 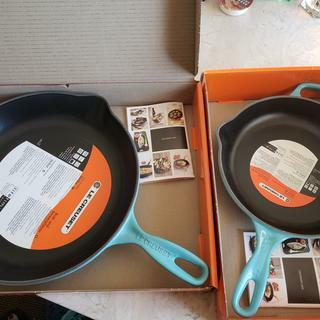 The 10 1/4 skillet is great and what we needed to complete our collection of LeCreuset cookware. The color saturation on the handle wasn't the greatest which is the only reason for the 4 stars. For cookware of this quality and price point the Q/A of the skillet handles have been challenging even after multiple returns/exchanges. In terms of usage, as with any of my LC cookware, the challenge is cleaning it. I love that its dishware safe but still requires a bit of rubbing/cleaning. In terms of size, we use it to cook large pancakes, scramble 8-12 eggs with ease and fry such as andouille. I find it tough to fit large flour tortillas shells for quesadillas in this size, so I use my 11 3/4 LC pan for those with much better success. This was purchased as a gift. It was a BIG hit! You can’t go wrong with ale Creuset! Beautiful. Wish I had invested in this piece years ago! Le Creuset still the best, still the gold standard. This is my third Le Creuset product, after I had to replace a previous (equally expensive) skillet by another well-known French manufacturer because it was sticking. Le Creuset may be pricey, but I always urge friends that it's well worth the price. Le Creuset products last forever, cook perfectly, and are beautiful to look at. I have this in Indigo. Works great. I haven't had a problem so far with food sticking. As soon as the pan has cooled I wipe out any mess and cleans up well. I liked the grip handle. Pans are heavy and the grip looked like it would be easier to handle if getting it out of the oven. I have wanted it for years and it is on sale now. I have two Le Creuset fry pans and love them. This one is for my daughter, so the 10.25" is perfect for dinners for 1 or 2 people. Special color available at Sur la Table! We love Le Creuset brand, and are adding this skillet to our growing collection. Thank you for having it on sale! Requested gift. Known to be good brand and product. Currently have cast iron pan. More of a nonstick would be nice. Although I love my carbon steel skillets, I wanted one that was non-reactive. For a holiday gift. Recipient is a great baker and needed a stovetop to oven option. TO replace my mothers square skillet that has grazing in the white enamel. Love this brand of cookware. My parents had this brand, I now have this brand and am gifting pieces to my daughter and son in law. After a long search for safest surface for every day cooking we have chosen this. I own others and like the brand. I have used mine for over 30 years and still love it! I have one, love it and wanted to give it as a gift to my nephew. I saved up tp purchase another piece of Le Creuset - and my favorite color is honey. The quality of Le Creuset is unmatched - I have become a better cook because of it. After cooking for nearly 50 years, I've never had a cast iron skillet and decided it was time. I love my Le Creuset Grill Pan so I know I will love this too. Because I needed a 10" skillet. May daughter loves her Le Creuset cookware, so I'm helping her expand her set. 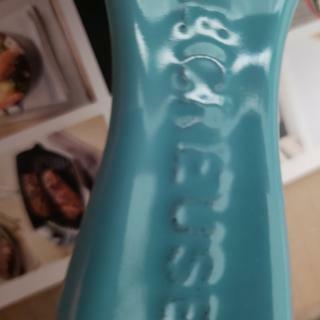 I love anything by Le Creuset, and this was on my daughter' secret Santa list. I have anemia and wanted a quality cast iron pan to cook in - Taking care of things the old-fashioned way! This is perfect! Because I wanted a LeCreuset skillet. My son is a cook and dearly wanted this! Got a new professional style gas range and needed a good quality cast iron skillet to prepare steaks,seafood and grill veggies. I am a much better cook with Le Creuset, everything turns out better and the flavors combine better. love this stuff. This will be my first piece of Le Creuset and thought this would be versatile and get a lot of use. I cannot wait to start cooking! How do you clean cast iron skillet? BEST ANSWER: Get ready: Gather your supplies and then preheat oven to 325°F.Wash the skillet: Wash the skillet with warm, soapy water and a sponge or stiff brush. Cast iron should not normally be washed with soap, but it's fine here since the pan is about to be seasoned.Rinse: Rinse and thoroughly dry the skillet with a clean, dry cloth or paper towels.Add oil: Pour a little vegetable oil or melted shortening into the skillet. 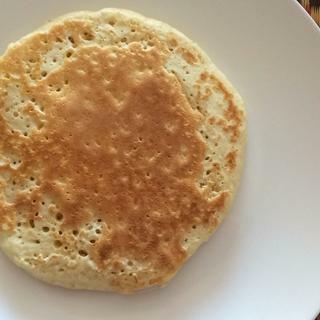 Vegetable oil and shortening are the most commonly recommended oils used for seasoning, but according to Lodge, you can use any oil of your choice.Rub: Use a new cloth or paper towel to rub the coat around the entire skillet.Flip the skillet over: Don't forget the outside — and bottom — of the skillet. You want a thin coat of oil around the entire piece.Bake the skillet: Place the skillet upside down on the oven's center rack. Place a sheet of aluminum foil below the rack to catch any drips. Bake for an hour.Let the skillet cool: Turn off the heat and allow to the skillet to cool completely before removing from oven. Once it's cooled down, you're good to go!NoteA seasoned skillet is smooth, shiny, and nonstick. You'll know it's time to re-season if food sticks to the surface or if the skillet appears dull or rusted. Is there a lid that will fit the 10.25# cast iron skillet? BEST ANSWER: Your site offers a number of 10.25' glass lids. Will any of these lids specifically the 10.25 " glass lid fit this cast iron skillet???? We do not carry a lid for this skillet. is it safe to assume that this pan must be seasoned like all other cast iron pans do? BEST ANSWER: As stated on the description on the Sur La table web page, "Matte-enamel interior requires no seasoning". Seasoning relates to the "old" cast iron your grandma / grandpa used that they never washed because it removed the seasoning. This enamel finish is far better and we wash it after each use. I had some old cast iron for cookouts but have used this Le Creuset skillet instead because of the cast iron heat retention and the great interior finish. Does that help? The packaging states that this is pre-seasoned, but I’ve found that unless I oil it after every use food tends to stick. I definitely cannot cook eggs in mine, but it’s great for searing steaks and finishing in the oven. I did not season my pan. There is a coating on the inside (like all Le Creuset) so you don't need to season. Also, after you use to brown, let it sit with warm water for a few minutes and much easier to clean. The beauty of this pan is that It does not need to be seasoned! It’s much easier to take care of. According to the literature that came with the pan, there was no seasoning process required. Is this skillet non stick? BEST ANSWER: Yes and no. If you will preheat it prior adding your food it doesn't stick. But it is not like a teflon coated pan. Goodness no. Supposedly it develops a patina which makes it easier to clean as you use it. Not my experience so far. BEST ANSWER: It's about 2" deep. Does it works for induction cooktop? BEST ANSWER: Yes, it is compatible with induction. Can this go in the oven? BEST ANSWER: Yes, we put outs in the oven often to finish cooking items browned on the cooktop, the heat retention of the cast iron it great for this. Yes up to 450 degrees. Do they slide on glass top stoves? BEST ANSWER: Yes. They can slide. But because of the weight of the pan.. it won't slide as easily as a light weight pan. I own 4 Le Creuset cast iron pans. I have never scratched my glass. No they do not slide. BEST ANSWER: I use the glass lid from my 10.25 inch Scanpan shallow dutch oven, it fits perfectly. I am not sure as I did not purchase the lid. What is weight of pan?